Provided for the betterment of your soul, is a summary of the Catholic Church, officially approved prophecies given by The Blessed Virgin Mary under Her title of Our Lady of Good Success (1634 A.D.) in Quito, Ecuador. The Virgin Mary declared that the ominous events She foretold would manifest themselves near the 20th Century. Prophetic revelations made to Venerable Mother Mariana de Jesus Torres in Quito, Ecuador 1634 A.D.
Our Lady prophesied that at the end of the 19th Century and especially in the 20th Century that Satan would reign almost completely by the means of the Masonic sect. The Blessed Virgin under the glorious title of Our Lady of Good Success told Mother Mariana that this battle would reach its most acute stage because of various unfaithful religious, who, "under the appearance of virtue and bad-spirited zeal, would turn upon Religion, who nourished them at her breast." "During this time," she continued, "insomuch as this poor country will lack the Christian spirit, the Sacrament of Extreme Unction will be little esteemed. Many people will die without receiving it - either because of the negligence of their families or their false sentimentality that tries to protect the sick from seeing the gravity of their situations, or because they will rebel against the spirit of the Catholic Church, impelled by the malice of the devil. Thus many souls will be deprived of innumerable graces, consolations and the strength they need to make that great leap from time to eternity..."
"As for the Sacrament of Matrimony, which symbolizes the union of Christ with His Church, it will be attacked and profaned in the fullest sense of the word. Masonry, which will then be in power, will enact iniquitous laws with the objective of doing away with this Sacrament, making it easy for everyone to live in sin, encouraging the procreation of illegitimate children born without the blessing of the Church. The Christian spirit will rapidly decay, extinguishing the precious light of Faith until it reaches the point that there will be an almost total and general corruption of customs. The effects of secular education will increase, which will be one reason for the lack of priestly and religious vocations..."
"The Sacred Sacrament of Holy Orders will be ridiculed, oppressed and despised. ...The demon will try to persecute the Ministers of the Lord in every possible way and he will labor with cruel and subtle astuteness to deviate them from the spirit of their vocation, corrupting many of them. These corrupted priests, who will scandalize the Christian people, will incite the hatred of the bad Christians and the enemies of the Roman, Catholic and Apostolic Church to fall upon all priests. This apparent triumph of Satan will bring enormous sufferings to the good Pastors of the Church...." "Moreover, in these unhappy times, there will be unbridled luxury which, acting thus to snare the rest into sin, will conquer innumerable frivolous souls who will be lost." "Innocence will almost no longer be found in children, nor modesty in women, and in this supreme moment of need of the Church, those who should speak will fall silent." "But know, beloved daughter, that when your name is made known in the 20th century, there will be many who will not believe, claiming that this devotion is not pleasing to God...A simple humble faith in the truth of My apparitions to you, My predilect child, will be reserved for humble and fervent souls docile to the inspirations of grace, for Our Heavenly Father communicates His secrets to the simple of heart, and not to those whose hearts are inflated with pride, pretending to know what they do not, or self-satisfied with empty knowledge." During this time, Our Lady foretold, "the secular Clergy will leave much to be desired because priests will become careless in their sacred duties. Lacking the divine compass, they will stray from the road traced by God for the priestly ministry, and they will become attached to wealth and riches, which they will unduly strive to obtain. How the Church will suffer during this dark night! Lacking a Prelate and Father to guide them with paternal love, gentleness, strength, wisdom and prudence, many priests will lose their spirit, placing their souls in great danger. This will mark the arrival of My hour." "Therefore, clamor insistently without tiring and weep with bitter tears in the privacy of your heart, imploring our Celestial Father that, for love of the Eucharistic Heart of my Most Holy Son and His Precious Blood shed with such generosity and the profound bitterness and sufferings of His cruel Passion and Death, He might take pity on His ministers and bring to an end those Ominous times, sending to His Church the Prelate who will restore the spirit of its priests." On December 8, 1634, the feast of the Immaculate Conception, three archangels and their Queen appeared to Mother Mariana. St. Gabriel was carrying a Ciborium filled with Hosts which Our Lady explained: "This signifies the Most August Sacrament of the Eucharist, which will be distributed by my Catholic priests to faithful Christians belonging to the Holy Roman, Catholic and Apostolic Church, whose visible head is the Pope, the King of Christianity. His pontifical infallibility will be declared a dogma of the Faith by the same Pope chosen to proclaim the dogma of the Mystery of My Immaculate Conception. He will be persecuted and imprisoned in the Vatican by the unjust usurpation of the Pontifical States through the iniquity, envy and avarice of an earthly monarch." This holy Pope was of course Venerable Pius IX who fulfilled every prediction made by Our Lady. His body recently exhumed, was found miraculously preserved in the tomb where it had lain for more than a century. His face still showed a striking serenity in death. Another most interesting prophecy of Our Lady: "In the 19th Century there will be a truly Catholic president, a man of character whom God Our Lord will give the palm of martyrdom on the square adjoining this Convent. He will consecrate the Republic to the Sacred Heart of My Most Holy Son, and this consecration will sustain the Catholic Religion in the years that will follow, which will be ill-fated ones for the Church. These years, during which the evil sect of Masonry will take control of the civil government - will see a cruel persecution of all religious communities, and they will also strike out violently against this one of mine." The "truly Catholic" president of Ecuador, Dr. Gabriel García Moreno (1821-1875), consecrated the republic to the Sacred Heart of Jesus in 1873. Pope Pius IX paid him tribute as a man who had died "the death of a martyr...a victim to his Faith and Christian charity." 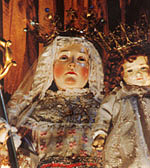 In the Cathedral of Quito there is a display of Gabriel Moreno's incorrupt heart and the famous painting of Our Lady of Quito, which wept at the moment of his martyrdom. On January 16, 1635, surrounded by her community and her Franciscan confessors, Mother Mariana made a solemn profession of Faith, and then asked, as a last favor, to die on the ground, in imitation of her Seraphic Father, St. Francis. After receiving Holy Communion and the Sacrament of Extreme Unction, she foretold the exact hour of her death: 3 p.m. Just before she died, she read her last will and testament, a moving testimony that gave her daughters inestimable advice about the religious life along with many prophecies concerning the order. At its end, she turned to the priests: "My fathers and sisters, the time has come for me to depart; recommend my soul to God with the appropriate prayers. I thank you for everything. Always, I beseech you, have this convent and your sisters in your care. I die, as I was born, joyously and peacefully in the arms of my mother, the Seraphic Order." Two tears rolled down her cheek, she sighed, and with an angelic smile, that blessed soul left her body. After death, her body remained flexible, her complexion rosy, and the charming smile on her face gave her every appearance of being alive. During the wake, the sight of a blind girl was restored when a flower from the crown that encircled Mother Mariana's head was touched to the her eyes. 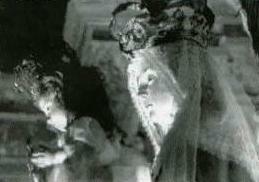 In 1906, during the remodeling of the Convent, her three-century old tomb was opened. They discovered the body of Mother Mariana de Jesus whole and incorrupt, complete with her habit and the articles of penance that had been placed in the tomb with her. An exquisite aroma of lilies emanated from her whole body. Thus God preserves some of his saints who practice heroic virtue and maintain holy chastity in their earthly lives. Mother Mariana possessed the gift of discernment of spirits, which Our Dear Lord so often gives to founders of religious orders. Since she could read the hearts of her daughters, she would comfort them, telling them how to progress in the spiritual life and explain how it was necessary to die to oneself in order to practice real virtue. She repeatedly warned them to guard the common life of the Convent and obey the Rule. When prayer and community life are wanting, she said, everything falls short, for the religious without prayer is like a soldier without arms in combat. She told them to be patient in their sicknesses, since illnesses are the best and most meritorious penances, which free souls from illusions, vanity and pride. She especially warned her daughters to guard against that "cursed human respect, which makes one ask: 'What will others say about this?'" Instead, she counseled that they should guide their lives in the cloisters according to the norms of the Gospel and ground themselves firmly on the strong foundation of humility. Let us consider some of the revelations that Mother Mariana was blessed to receive from Our Lord and Our Lady. "Woe to the world should it lack monasteries and convents!" Our Lady: "Oh, if only human beings and religious knew what Heaven is and what it is to possess God, how differently they would live, sparing no sacrifice in order to enter more fully into possession of it! But some let themselves be dazzled by the false glamor of honors and human greatness while others are blinded by self-love, not realizing that they are falling into lukewarmness, that immense evil which in religious houses destroys their fervor, humility, self-renunciation and the ceaseless practice of religious virtues and fraternal charity and that child-like simplicity which makes souls so dear to my Divine Son and to me, their Mother. "Remember the words of the Royal Prophet: 'How marvelous are the works of the Lord!' Be convinced of this truth; teach and impress your daughters both living and those to come that they should love their divine vocations. Reveal to them the glorious place that God and I are saving for those who belong to Us, our heirs. "Woe to the world should it lack monasteries and convents! Men do not comprehend their importance, for, if they understood, they would do all in their power to multiply them, because in them can be found the remedy for all physical and moral evils... No one on the face of the earth is aware whence comes the salvation of souls, the conversion of great sinners, the end of great scourges, the fertility of the land, the end of pestilence and wars, and the harmony between nations. All this is due to the prayers that rise up from monasteries and convents. "O, if mortals only understood how to appreciate the time given to them, and would take advantage of each moment of their lives, how different the world would be! And a considerable number of souls would not fall to their eternal perdition! But this contempt is the fundamental cause for their downfall!" Our Lady emphasized the importance of the Sacrament of Penance and the important role of priests: "See and contemplate the grandeur of this restoring and life-giving Sacrament of Penance, so forgotten and even scorned by ungrateful men, who in their foolish madness, do not realize that it is the only sure means of salvation after one has lost his baptismal innocence. What is most grievous is that even the ministers of My Most Holy Son do not give to it the value that they should, viewing with cold indifference this valuable and precious treasure, which has been placed in their hands for the restoration of souls redeemed by the Blood of the Redeemer. There are those who consider hearing confession as a loss of time and a futile thing. O, alas! If priests were given to see directly that which you are now contemplating and were enlightened with the Light that now illuminates you, they would then recognize this gift!..." Our Lord: "For in all times I have need of valiant souls to save My Church and the prevaricating world." Our Lord also made Mother Mariana understand more clearly than ever before that devotion to the Passion, to the Blessed Sacrament and to Our Lady constitutes the support and mainstay of religious communities. "Know, moreover, that Divine Justice releases terrible chastisements on entire nations, not only for the sins of the people, but for those of priests and religious persons. For the latter are called, by the perfection of their state, to be the salt of the earth, the masters of truth, and the deflectors of Divine Wrath. Straying from their divine mission, they degrade themselves in such a way that, before the eyes of God they quicken the rigor of the punishments..." He also assured Mother Mariana that He was greatly pleased by those souls who take upon themselves the sublime task of suffering for the sanctification of the Clergy by means of their prayers, sacrifices and penances, and promised such souls a special glory in Heaven. The ingratitude and betrayal of religious souls, so dear to His Heart, would compel Him "to let My Justice fall upon My beloved cloisters - and even over cities - when those so near to Me who belong to Me reject My spirit, abandoning Me alone in Tabernacles, rarely remembering that I live there especially for love of them, even more than for the rest of the faithful." Imprudent admissions and internal abuses permitted by superiors are the ruin of communities. "Such communities can only be preserved - while they exist - at the cost of much penance, humiliations and daily and solid practice of the religious who are good. Woe to these corrupt members during those times of calamity! Weep for them, beloved spouse, and implore that the time of so much suffering will be shortened." He warned her that the chastisement would be severe for those religious who squandered the many graces with their pride and vainglory to secure positions of power and rank and He especially condemned the lukewarm religious. 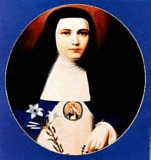 Mother Mariana saw that the greatest interior torments of the Sacred Heart were the ingratitude and indifference of those souls who, chosen among millions to be His spouses and ministers, left Him in the most absolute solitude. And this despite the fact that in the Holy Sacrament, He would live under the same roof with His spouses and come into the hand of His priests at the simple call of their voices at the most solemn moment of the Consecration. We are living in a time of the great crisis of Faith and morals as prophesied by Our Lady. The confusion is of such magnitude that it is not only subverting the temporal sphere, but also penetrates the walls of the Church itself. Indeed, as Our Lady prophesied, the corruption of customs has become general and the precious light of Faith almost extinct. Yet the message of Our Lady of Good Success ends with a note of great hope: When everything will seem lost and paralyzed, that will be "the happy beginning of the complete restoration. This will mark the arrival of my hour, when I, in a marvelous way, will dethrone the proud and cursed Satan, trampling him under my feet and fettering him in the infernal abyss." It is the promise echoed by Our Lady again at Fatima in 1917: "In the end, My Immaculate Heart will triumph." Thus it seems opportune to turn to Our Lady of Good Success and invoke Her, begging for every good success - both temporal and spiritual. It is the moment to ask for Her orientation and certainty amid this storm, and the courage and strength to keep aloft the standard of the Faith. Finally, let us pray that Our Lady will intervene quickly to restore the Church and society, so that She may reassume Her throne and reign again in glory as Queen of all the earth. © Copyright 2004-2011. All rights reserved.